I’ve become a total convert to homemade chicken stock. Contrary to what you’re probably thinking, it’s really not hard at all — and it not only gives you amazing stock instead of the “eh” canned/boxed version, you also get a delicious, tender chicken out of it. I had a lot of trouble picking a recipe for this. Do a little research and you’ll see that everyone has their own way of doing it — some use just chicken bones, others use a whole chicken and still others use just wings/legs. I figured it was most reasonable (also, easier!) to just use a whole chicken, since you can use the cooked meat afterwards for some sort of delicious meal. It worked out really well. 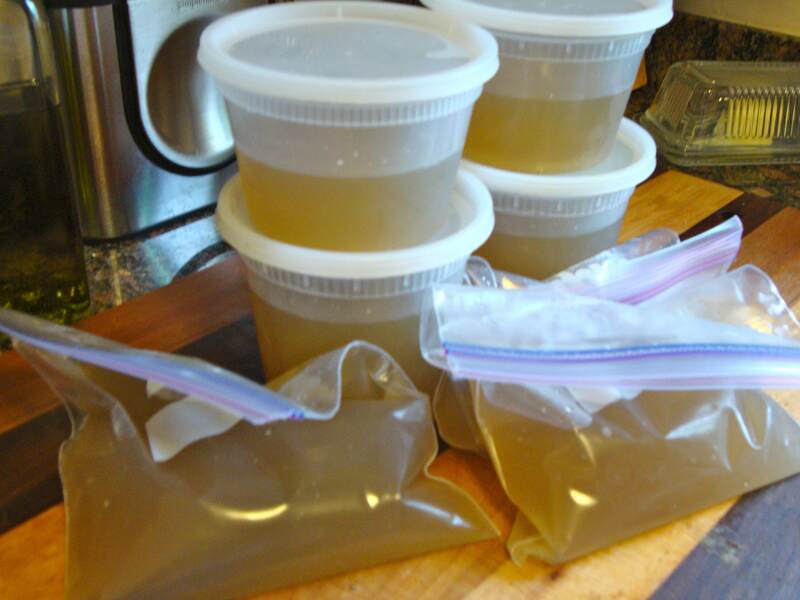 I froze the stock in one- and two-cup portions, which makes it easy when you’re using a recipe that calls for a certain amount. They don’t take long to thaw in the fridge or just stick them in a bowl of lukewarm water and it thaws in no time. It made 9 cups total. Not too shabby! For some reason the grocery store sold only chickens in the 5 pound range; just adjust the goodies you add in to make up for it — more onion, couple more celery stalks, etc. Before you strain the stock, use a slotted spoon to remove the big pieces of vegetable. Then take out the chicken. Careful! It will be so tender it will fall apart. Use a couple of big spoons and make the transfer quickly. Refrigerate the strained stock overnight so the fat has time to settle on the top. Skim it off the next morning and pack the stock in measured increments. If you want to concentrate the flavor more, put the strained stock back on the stove and boil it for a little while longer. Once the chicken cools, take the meat off the bone and shred it. Use it in soup or another recipe that calls for cooked or rotisserie chicken. I used it in chicken/sweet potato quesadillas…post to come on that! Place the chicken and vegetables in a large stockpot over medium heat. Pour in only enough cold water to cover (about 3 quarts); too much will make the broth taste weak. Toss in the thyme, bay leaves, and peppercorns, and allow it to slowly come to a boil. Lower the heat to medium-low and gently simmer for 1 to 1½ hours, partially covered, until the chicken is done. As it cooks, skim any impurities that rise to the surface; add a little more water if necessary to keep the chicken covered while simmering. This entry was posted in Recipes, Uncategorized by Tricia. Bookmark the permalink.